It’s become progressively easier over the years to produce and publish podcasts. But there are still a lot of moving parts involved in the process. Recording, editing, uploading, publishing to the web, and syndicating thru RSS are just a few of the steps needed to take a podcast from concept to reality. 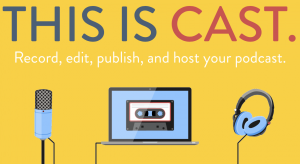 A veritable cottage industry has arisen to help guide podcasters thru all of the technology and services that are available for producing podcasts. But what if there was one tool that did everything? That’s where Cast, a new web-based podcast production system comes in. Record high-fidelity audio, alone or with guests around the world with no extra software. It’s all stored in the cloud. Edit your podcast quickly. Drop in audio, and make use of powerful presets like dynamic compression. Publish your podcast with the click of a button – all Cast plans include hosting, RSS feeds, and analytics at no extra charge. No login required for guests. Live text chat & show notes. Audio storage in the cloud. Nothing to download, Cast does everything in a web browser. Cast has two pricing tiers. The “Hobby” tier costs $10 per month, includes 10 hours of recording time per month with unlimited editing and mixing, unlimited podcast hosting, and one RSS feed. The “Pro” tier costs $30 per month and comes with 100 hours of recording time per month, unlimited editing and mixing, unlimited podcast hosting, and unlimited RSS feeds. A free trial of the Hobby tier is available for one month. At first look, the Cast system may appear costly. But when you factor in that both tiers include media hosting, the overall price levels out a bit. Podcasters tend to be fiercely loyal to the products and services they use in producing their shows. Only time will tell if Cast becomes a truly viable player in this space. Given the full-featured nature of the service, it definitely shows a lot of promise. This is an interesting concept. I’d love to find out who is behind it though.